How to purchase a Bluetooth Tweaker license? 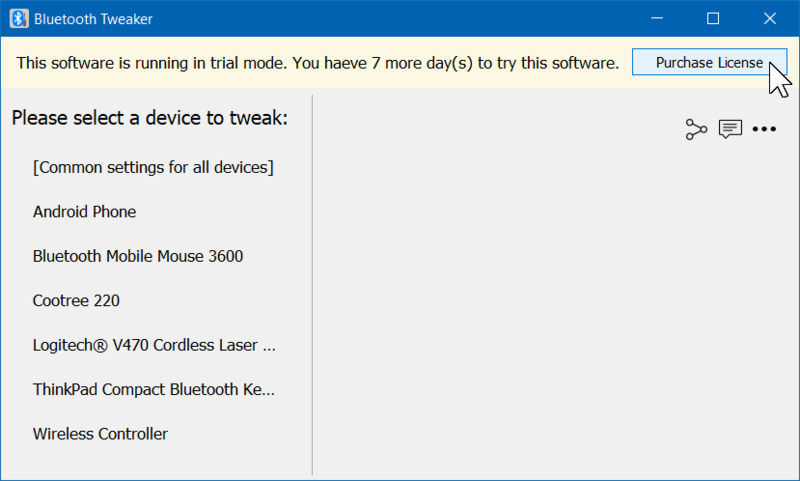 Install Bluetooth Tweaker (version 1.0 or later) to your PC. 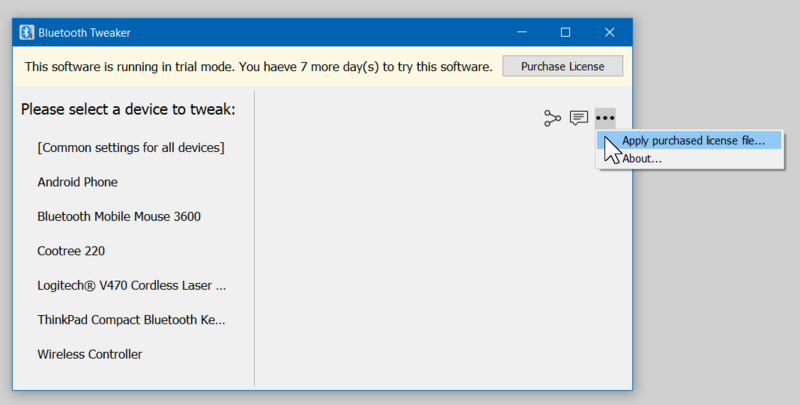 Click on the “Purchase License” button on the main window. You will be lead license purchase page. I have purchased the license. What's the next step? You will receive an e-mail from us (Bluetooth Tweaker Support / support@bluetoothgoodies.com). Please open the e-mail and save the attached license file (BluetoothTweaker.btlic) to the directory of your choice. Click on the ellipsis (…) at the right top corner of the window. Select the license file you saved in the first step. Now your software is activated. Please save the license file in a safe place. You may need it later when you re-install the software. I made a payment for the license but did not receive a license file. (If you paid with PayPal) Check PayPal payment transaction status. Please check the e-mail from PayPal or log in to your PayPal account and verify the status of the transaction first. Sometimes transaction remains in "pending state" for up to a couple of days. If this is the case, we cannot issue the license until the transaction "completes". Check if the e-mail was mistakenly marked as a SPAM mail. Unfortunately, an e-mail sent from a small company like us, using an automated system that has an attachment is often considered suspicious and marked as a SPAM mail. Please check your SPAM / junk mail folder and look for a mail from “Bluetooth Tweaker Support”. This problem seems to happen more frequently if you are using Microsoft's e-mail services such as outlook.com or hotmail.com. If you don't find it in your junk mail folder, please contact us. We will get back to you as soon as possible. Please allow us up to one business day to respond.